The Road to the Horizon: Are these the humanitarians of the future? Are these the humanitarians of the future? "Where are the future markets for private security contractors? In recent years, thanks to the wars in Iraq and Afghanistan, their clients have been primarily governments or contractors doing reconstruction work." "This would not be entirely new. Organizations like CARE and the World Food Program have extensively used armed escorts in transporting aid to needy populations. While armed escorts are normally provided by host governments, in cases where state authorities lack effective control, those organizations have hired private security companies to protect aid convoys." "Since PSC can't take direct action on behalf of the United Nations or individual states, they look to provide security for those doing humanitarian relief. And those providing such relief need it, as humanitarian workers have been increasingly targeted in recent years." "Another reason, according to Spearin, why PSCs (Ed: Private Security Companies) might be used more by humanitarian NGOs is that they offer greater resilience when faced with violence. Many NGOs, when their personnel have been wounded or killed, have simply withdrawn from a country. That is not their fault. They are not combatants and should not be expected to fight like them." - Private Security Companies "have proven" to be "a viable alternative" for work too dirty for regular armed forces. - Their work-ticket bubble in Afghanistan and Iraq will soon come to an end. - Host governments and UN member states become more and more reluctant to provide the needed security or peace keeping forces. And all of that might become quite an enabling environment for the Blackwaters of the world. Proof of the matter: Blackwater is now providing private security for commercial vessels off the coast of Somalia. "Our outreach programs support human development, health, education, nutrition, housing and disaster relief the world over. When crisis or disaster strikes, Blackwater is ready to reach out and help those in need." Blackwater, a private army and mercenary headquartered in Moyock, NC with over $1 billion in federal contracts (primarily no-bid) since 2001, operates with impunity, not subject to either military or civilian law. 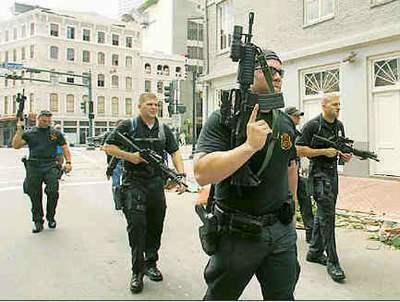 Blackwater is associated with tax evasion, gun running, weapons stockpiling, recruiting death squad paramilitary personnel from Latin America and defrauding US taxpayers. Blackwater operates without oversight, transparency or accountability. Thanks to lobbyists retained by Blackwater, like Womble, Carlyle, Sandridge & Rice, Blackwater's contract with the US State Department was renewed this past April. This despite the Iraqi government having ordered Blackwater out of its country and the stonewalled investigation into the Nisour Square massacre. Despite press reports to the contrary, Blackwater has confirmed that it has no intention of leaving the security contracting business. Blackwater is expert at using influence peddling professionals like Womble Carlyle and its connections with the White House administration to remain free from harm and open for business. A Bush administration appointed federal judge recently forced the city of San Diego to allow a shell company created by Blackwater to open a training facility inside the city limits, within a mile of the Mexican border. The Bush administration has hinted at militarizing our border with Mexico and Blackwater is positioning itself for future federal contracts to provide border security. Gaza: Ripped apart by bullets. A walk and "Mr. H"
Wanted: Prime minister for Belgium. Christmas dinner. Three different takes. Rumble: Three struggling aid workers. News: Gaza, the sad facts of a forgotten crisis. Rumble: I don't wanna be there. News: Zimbabwe, cholera and denial. Rumble: Blogging tools - The Nerd Is Back ! Rumble: Web 2.0 and the choice of aid. FLASH: The Road now got its own discussion forum! News: US - 1.2 million jobs lost in 3 months. Rumble: Today. And my favorite music station. News: UN - millions, billions and zillions. News: Who took my oil tanker? Rumble: The Financial Crash for Dummies. Rumble: Help. I outsourced my life! News: Obama appoints US ambassador to the UN.